We were not informed that you had to reserve tickets online for the FREE Days. We knew tickets were timed and limited, but it was never specifically noted to us that they were required to be reserved online and not available at the door. We apologize for any confusion on our part. The two remaining SCFD FREE Days on March 5 and April 2 are both sold out. The Museum of Outdoor Arts (1000 Englewood Pkwy.) in Englewood is really taking its new art exhibit to the next level. Like stepping into a painting, “Natura Obscura” is an immersive art experience where you can hear, smell, touch and explore everything around you. It’s a complete sensory overload, but in the best way possible. The wit and whimsy of it all is a welcome break from the real world. 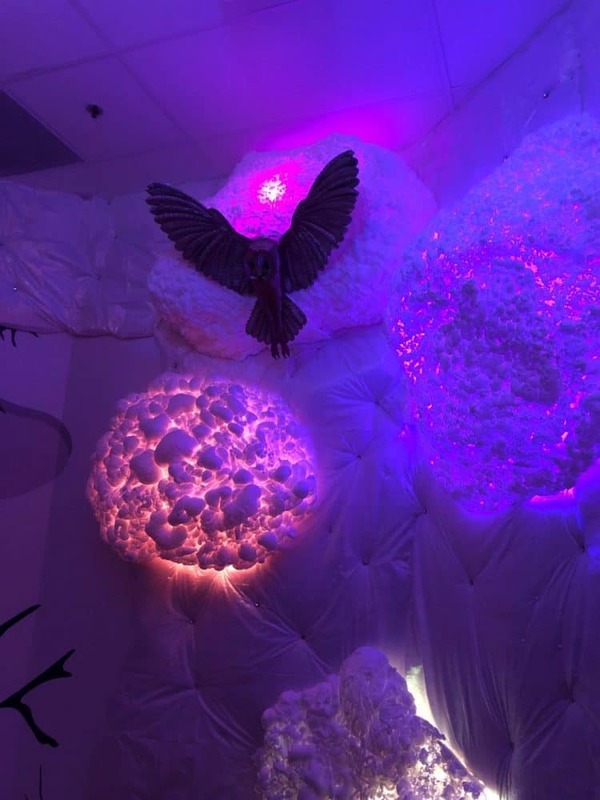 Families (especially kids) and deep thinkers alike will appreciate the journey “into the woods.” The installation is a collaborative work among many local creatives, including several Colorado artists. There’s definitely a “wow factor” upon entering, letting you know you’re about to enter “a whole new world” — physically and metaphorically. It’s part art museum and part virtual reality experience. The self-guided journey is an exploration through a surrealist forest combining art, sculpture and the latest in virtual, augmented and digital technologies. As you wander among the trees and fantastical woodland creatures, you might even confront a yeti along the way. The interactive art installation runs January 11 through April 28. Tickets are up to $25. However, you can walk “into the woods” for FREE on Tuesday, February 5, Tuesday, March 5 and Tuesday, April 2. On the FREE Days, the exhibit is open from 10 a.m. to 6 p.m., with the last admission at 5 p.m. Otherwise, the best deal is to purchase tickets online for admission on Tuesday or Wednesday for just $10. (You’ll pay extra, if you buy tickets at the door. Plus, an online ticket guarantees admission.) For the full pricing schedule, click here. On the flip side, adults will appreciate the deeper meaning behind the exhibit with its philosphical and inspirational quotes throughout. Definitely don’t miss “Cosmos: A Monk’s Dream” for a few minutes of complete serenity. Set down your smartphone and really take in the sights and music. I tried to go to the museum today but they said you had to get tickets online ahead of time, even if they are free. They were already at capacity today so I didn’t get to go in. The “free” day is already sold out for March and almost sold out for April. Got to check out Natura Obscura today–so cool! Wanted to pass along that on free days, tickets are still required to enter. We got lucky and they weren’t at capacity yet so we could “purchase” them, but I was told for future free days to reserve tickets ahead of time. Highly recommend this exhibit! !